A week before Christmas, we received a large package in the mail from David and Kinsey, Mark's brother and wife (who is also one of my dear friends). As you've seen before, Kinsey is a photographer. It is why we have soooo many beautiful professional photographs of our family. 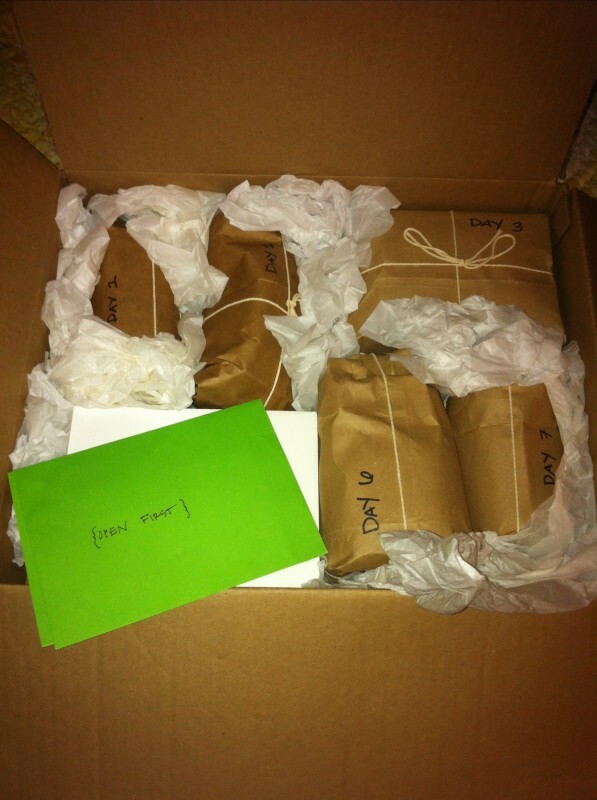 With that talent, Kinsey is obviously incredibly creative...and thoughtful. She enlisted the whole family to submit memories they have of Vienne along with corresponding gifts to reminds us of those memories. 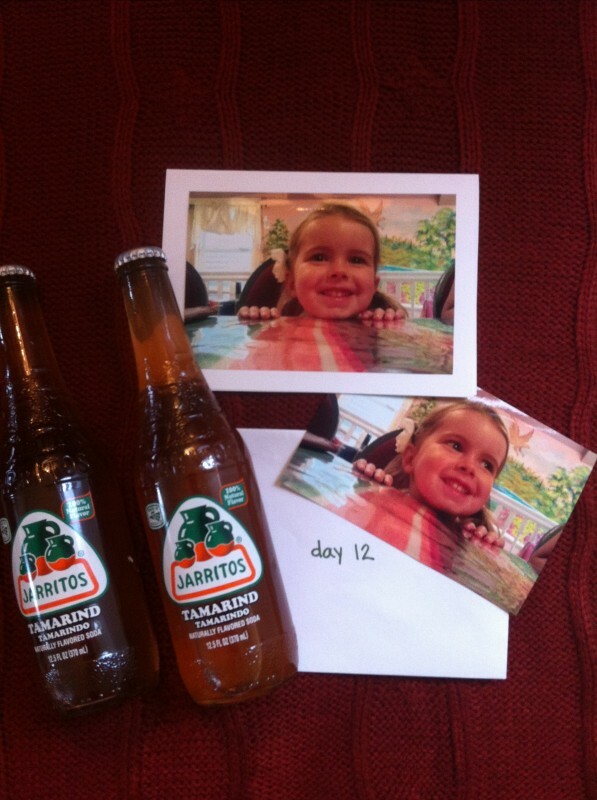 12 gifts...one gift and memory a day. =The most treasured gift I could think of. This 12 day countdown of memories kept Vienne present on our minds, even more so than usual, as we endured this Christmas season. "I think Vienne was just about a year old on this visit we made to Cannon Beach. We spent the morning taking pictures in a coffee shop and at the beach. Sitting next to her in the coffee shop, snapping a few candid pictures of her while she laughed, tickled, played peek-a-boo, and curiously investigated all around - her stunning beauty came out, not just in those pictures, but in her personality." 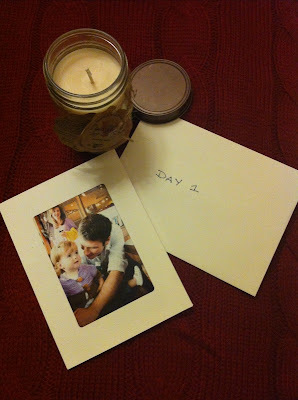 Meaning of gift: "Coffee scented candle - Every time you light it, remember our sweet time sitting in that coffee shop." "Spring of 2010. I believe it was our first visit to your townhouse. That Saturday morning you took us in to Portland to the Saturday Market. My favorite part of that whole trip was watching Vienne shuffle down the side walk in those oversized Chinese slippers. It was the most adorable thing I had ever seen. Her determination." 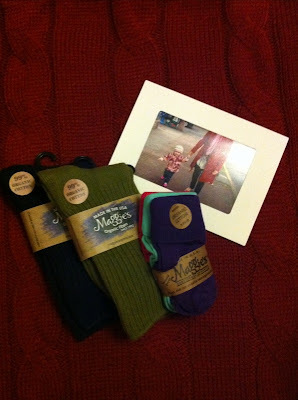 Meaning of Gift: "Special shoes=special socks...in almost her favorite colors. Every time you wear these socks I hope you remember that sweet moment walking down the street." "The weekend that just Mark and Vienne came up to WA for a visit - We were all playing outside. The girls were playing in the swimming pool. After a while of 'in&out' in the wading pool, it became too dirty for Vienne to want to get in (dirty with grass). Mark's brilliant solution: if she sat on the floaty ring, she wouldn't touch the dirt in the pool. He was right. She was happy." 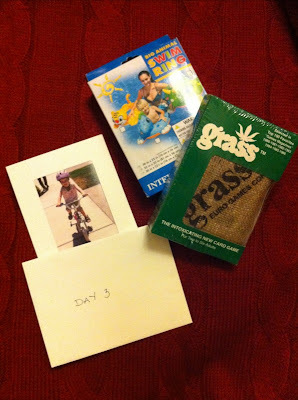 Meaning of gift: "Grass in the pool = floaty ring to the rescue. 'Grass' card game and dinosaur floaty ring. So now every time we see these things we remember our special grassy pool memory and think of Vienne." "Fall of 2010. We went to Remlinger Farms. It was a little bit chilly out, but Vienne looked adorable in her colorful hat (that I have since seen Ivy wear). We did so many fun things - rode the train, saw some animals, went through a hay maze & jumped in a hay trampoline. But my favorite part: Watching Vienne go on her first ride! She even put her hands up on the roller coaster. My first glimpse into this brave, thrill-seeking little girl. I also remember her falling asleep in the car on the way home and Grandma Lynn insisting on sitting on the porch until she woke up." 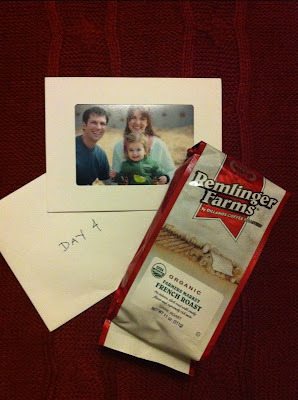 Meaning of gift: "Remlinger Farms Coffee. Enjoy a cup of coffee and remember our time at the farm." "Ivy was about 5 weeks old. We came down to meet her. We did an impromptu photo shoot. I'm so glad we did. Some of my favorite pictures of Vienne are from this visit. Taking candids of her while she made dinosaur footprints in the play-dough 'snow'. Oh how I loved her joy and wonderment at the sight of the footprints. And telling me all of the dinosaur names and their stories. This was the first time I saw her as a big sister, too. She had so much love for her sister. She always wanted to be holding her. She always wanted to hold Elliott but E wouldn't sit still. Such a creative, imaginative little girl." 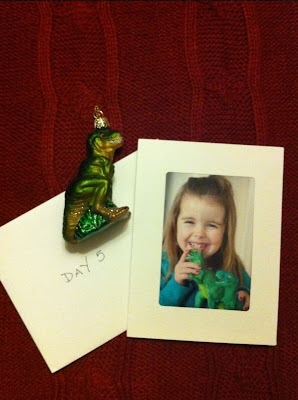 Meaning of gift: "Oh how special and dear dinosaurs are now. Forever they will remind us of her. Hope you can hang this ornament next year on your tree." We were all driving in the car to Cottage Lake Park. Vienne was eating her snack of trail mix that her Mom made. I watched her for a moment and realized that she was just picking out the "chocolate" pieces (carob chips). She said the chocolate was her favorite. On the car ride home she and Mark were deciding if they should take a walk to the park by our house or take a nap. Vienne said, "I'd like to go to the park! But first I want to take a nap, so I can dream about mommy". Oh she melted my heart." 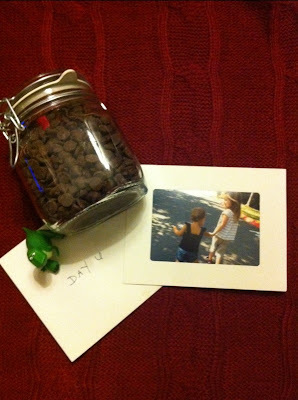 Meaning of gift: "Chocolate (carob) trail mix - a jar of carob chips/chocolate bars. Every time you eat a chip or use this jar, think about her love for chocolate and for you." "The weekend of Elliott's 1st birthday - We were at Grandpa Tom's house. Grandpa Tom had made a giant bonfire outside. We were shoveling sand by the mini fire pit, flipping rocks to look at baby crabs on the beach and the best one: picking up golf balls as the tide went out. Vienne was a little hesitant, at first, to walk on the rocks, so we held hands and walked to pick up two golf balls at a time, one for me and one for her. Vienne was so curious, excited, brave, and adorable. I can't tell you how special it was to me to get to share a new experience with Vienne. I will always cherish this fun day." 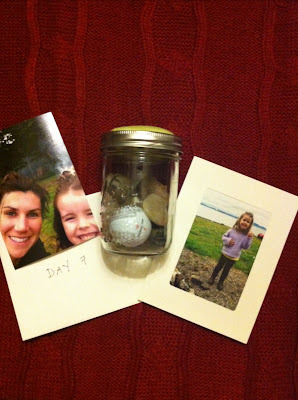 Meaning of gift: " Searching for golf balls on the beach - the beach and the golf ball in the jar - a reminder every time you see it or when we see a golf ball of this special bonding moment." "This was the weekend you came to visit, after Elliott was born - What a sweet memory! Mark went golfing with his siblings. Vienne came along to allow Jenny to sleep in, since Vienne always woke early and this day required an early start. I also went along, mostly to spend more time with Vienne...even though I don't play golf. I had the joy of just "chillin" with Vienne while Mark and everyone played each hole. As you see in the picture, she was sporting some very stylish sunglasses and white ruffly socks to complete her sporty ensemble. She was so patient and relaxed in the sunshine each time we stopped the golf cart for everyone to advance toward the next hole. She kept those sunglasses on the entire nine holes and looking at her just always made me smile. What an adorable pretty picture she was in the middle of that golf course! Her "lounging posture" cracked me up. She was happy to just be a part of this sibling adventure. Any other child might have been a concern because it's unlikely they would've stayed in or very near the golf cart. Not so with Vienne! In fact, when the golf game was over and the person in the clubhouse realized Vienne had been out on the course, it was noted that children aren't allowed to be on the course. However, she didn't know our little Vienne!" 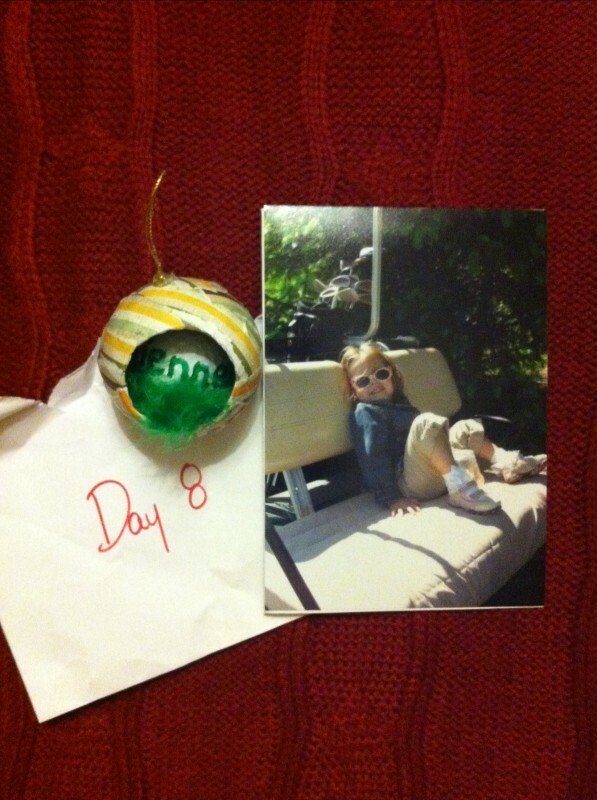 Meaning of gift: "A homemade ornament with a golf ball and "grass" in it. Gold ball has Vienne's name on it." "I remember the time we went to the mexican restaurant and I wanted to sit next to Vienne. 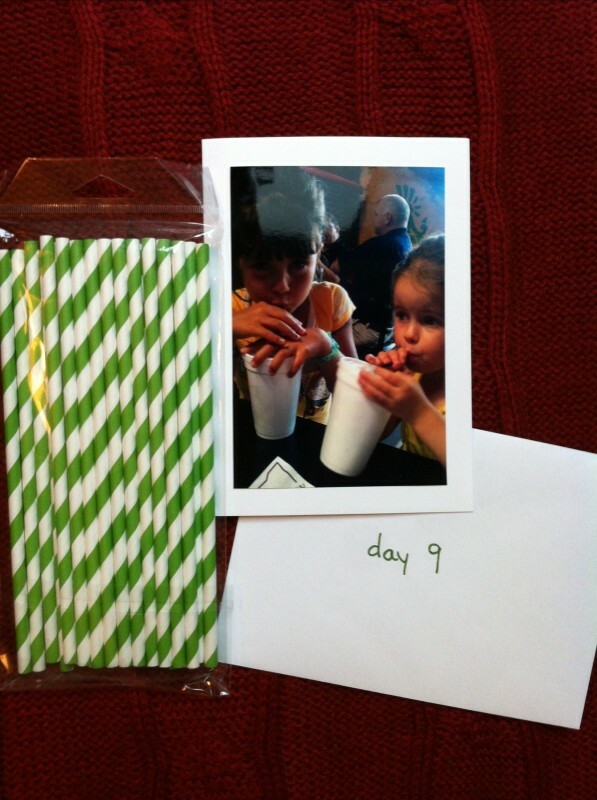 We were sipping on straws together." Meaning of gift: "Here are some straws for this memory. Love Ellie"
Luke is 7 and wrote this memory himself. "I remember playing games in Grandpa Tom's kids play house with Vienne. Love Luke". 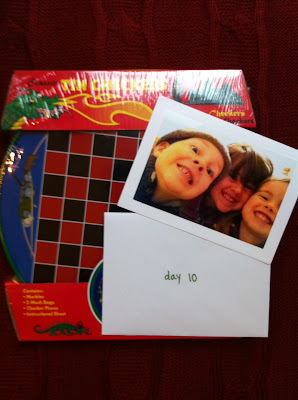 Meaning of gift: Checkers and Chinese Checkers game. "This was at Grandpa Clem's 90th Birthday party. I got to sit next to Vienne and I'm glad I did. Well, Ellie was actually "sitting" next to Vienne (naturally) but she was bouncing around so much that I got to sit next to Vienne for a lot of the time. Vienne's beauty and her delicate gracefulness just captivated me that day. I watched her peel and stick her stickers from the kids' goodie bag into paper with so much concentration. Everything was done meticulously and with great carefulness. Her face was so angelic in that moment, I couldn't stop taking pictures of her. I'm glad I had this time to watch her. I enjoyed it so much and I will always remember her this way." 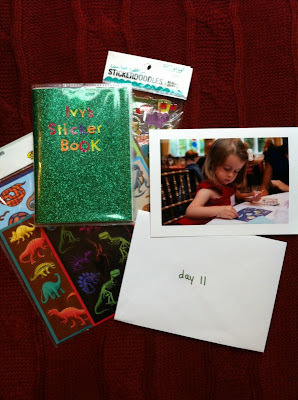 Meaning of gift: "A sticker book for Ivy to enjoy creating art with stickers the way Vienne did." "At the Jersey shore in the summer of 2011, we all went on a walking adventure, the 7 of us. Our kids walked down the sidewalk holding hands, chattering. We found this little mexican restaurant and, of course, Ellie and Luke fought and squabbled over who got to sit next to Vienne. But, I (Becky) got to sit across from her and cherish this as one of the first times I got some extended "face time" with Vienne. I enjoyed it so much - she was such a cheerful little ham, silly and smiley and I just remember her making us smile and laugh throughout the whole meal." Meaning of gift: "We were all drinking these sodas - I hope they can serve as memoirs." **David, Kinsey, Dan, Becky, Christy, Lynn, Ellie, and Luke ~ We cannot thank you enough for this treasure of a gift. We love you all sooooo very much. I have big tears in my eyes. What a precious, thoughtful, meaningful gift. 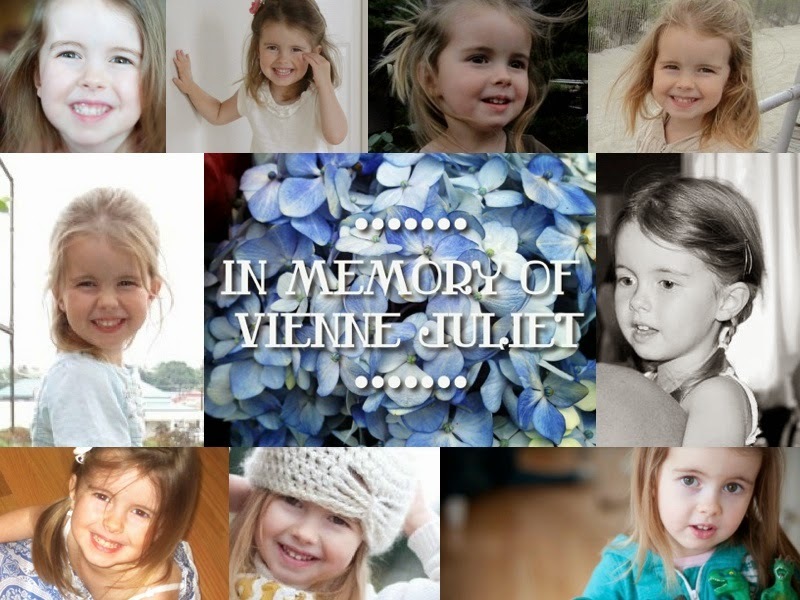 Vienne so obviously touched so many lives in her time with us....what a beautiful gift. Love you guys. What a special, amazing gift! I read it all with tears in my eyes as well. How touching that they took the time to do this for you and for Vienne's memory...and it's another amazing example of the impact your special girl had on everyone around her. I wish we could have done more. We all miss her so much. Beautiful gift!! This made me cry! !